Exposure to microgravity has been shown to weaken astronauts’ immune systems and increase the activity if harmful microorganisms. The news from space medicine is not all bad, however. New research suggests that thyroid cancer cells enter a less aggressive state under the influence of microgravity. By understanding the genetic and cellular changes that occur in space, scientists may be able to develop new cancer treatments for use on Earth. “Differential Gene Expression Profile and Altered Cytokine Secretion of Thyroid Cancer Cells in Space” was published in the February issue of The Journal of the Federation of American Societies for Experimental Biology. Grimm and colleagues from Denmark and Germany used the Science in Microgravity Box facility aboard the Chinese Shenzhou-8, which was launched on October 31, 2011. Cell feeding was performed automatically on day 5 of the mission and automated cell fixation was conducted on day 10. An onboard centrifuge was used for inflight control cultures. On the ground, additional cells were tested using a random-positioning machine, which aims to simulate microgravity by rotating a sample around two axes. Cells were studied for gene expression and secretion profiles, using modern molecular biological techniques such as whole genome microarrays and multi-analyte profiling. Results suggest that the expression of genes that indicate high malignancy were down-regulated in microgravity. 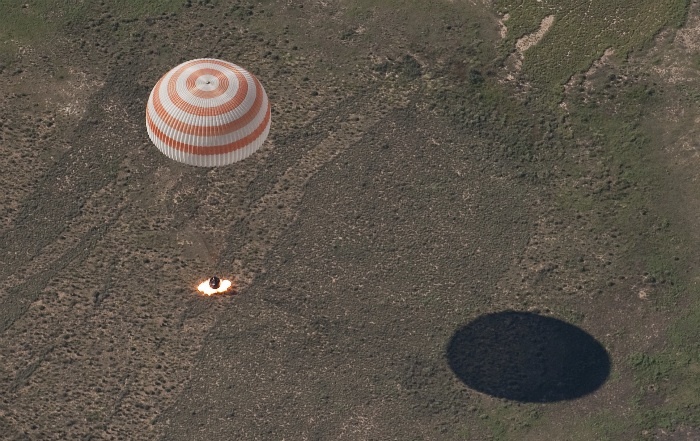 Soyuz TMA-08M suffered a failure during its descent over Kazakhstan on September 11. The capsule’s altitude sensors, which determine timing for retrorocket firing, failed. Fortunately, the rescue crew was able to radio audio cues to the flight crew. Because the astronauts were unable to follow their altitude from readings in the cockpit, recovery crews on the ground kept them updated with information being relayed to them from Russian Mission Control. This is not the first time NASA has downplayed problems with the Soyuz capsule and launcher. NASA seems willing to trust the Russian Space Agency despite multiple problems, while insisting on super-strict Human Rating Standards for US companies such as Boeing and SpaceX. Are NASA’s Radiation Standards Too Restrictive? Peggy Whitson, the former head of the NASA Astronaut Office, believes NASA’s radiation standards are too restrictive and discriminate against female astronauts. Whitson expressed her views at a workshop on Ethics Principles and Guidelines for Health Standards for Long-Duration and Exploration-Class Spaceflights, conducted by the National Academy of Science’s Institute of Medicine. The story was reported by Space.com. NASA limits astronauts’ lifetime radiation exposure to keep the probability of radiation-induced cancer death below 3%. The limit for NASA astronauts is higher than the limit for terrestrial radiation workers. Women are more susceptible to certain forms of cancer, however, so the limit for female astronauts is lower than the limit for male astronauts. A female astronaut can fly only 45-50% as many missions as a male astronauts, Whitson said. Many of NASA’s astronauts are already limited by their lifetime radiation exposure. According to Col. Robert Behnken, who replaced Whitson as head of the Astronaut Office, only three of NASA’s 50 astronauts were eligible for the recent one-year mission to ISS, because of radiation limits. A mission to Mars is probably impossible within current radiation limits. First, is NASA calculating the radiation risk correctly? At present, no one has good data on the biological effects of long-term low-level radiation exposure. Instead, the risks are inferred from data on the effects of short-term, high-level radiation exposure (collected from events such as Hiroshima and Nagasaki). This data is applied to low-level radiation using an extrapolation model known Linear No Threshold (LNT). The LNT model assumes that a given dose of radiation will have the same effect regardless of the dose rate. It is a highly conservative model, which assumes the body has no way to recover from the effects of gradual, low-level radiation exposure over time. It ignores the usual principles of toxicology and much of what we know about the biological repair mechanisms. There is no scientific evidence to prove the LNT model is correct, but the government has adopted it out of an abundance of caution (the “precautionary principle”). The LNT model has been criticized many times in the past, but environmentalists and anti-nuclear activists have resisted any attempted change. In space, however, the precautionary principle may cost NASA the chance to go to Mars. Second, does the 3% fatality limit makes sense? The Shuttle had about a 2% fatal accident rate on each flight, as does Soyuz. Future launch systems may do better, but right now, an astronaut who flies multiple missions has a just of death that is significantly greater than 3%. Third, is the male-female dichotomy really the best way to classify radiation risks? There’s no doubt that cancer risks differ between men and women, but gender is only one of many variables that affect cancer risks. With the development of modern genomics, we’re reaching the point where it’s possible to determine risks on a personal level based on individual genetic markers. This is part of an emerging field known as personalized medicine, which treats people as individuals rather than broad statistical groups. Inspiration Mars is looking at personalized medicine to help select crew members for its proposed Mars flyby mission. Is NASA doing the same? These are questions which NASA needs to answer as it plans for future exploration activities. NASA has powered down the Mars Science Laboratory Curiosity as a precautionary measure due to a solar flare. In 2003, a solar storm damaged a radiation instrument on the Mars orbiter Odyssey. 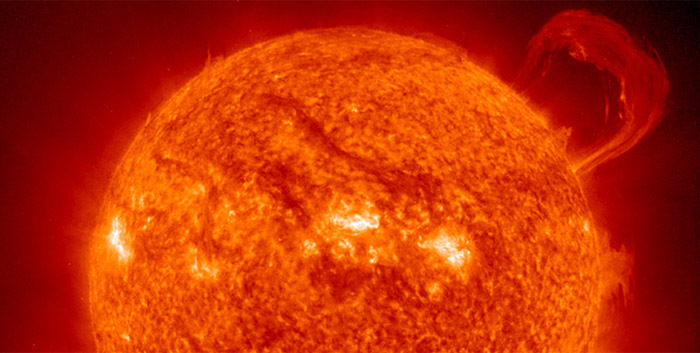 NASA does not believe the radiation from this flare poses any danger to Curiosity but is being extra cautious due to recent computer problems with the $1.6 billion rover. This shutdown illustrates the need for good space-weather forecasting for in-space operations, but space weather also affects the Earth. It will be important for future space travelers as well. A panel discussion on “Space Medicine in the 21st Century: Commercial and Governmental Opportunities” will take place in Menlo Park, California next Thursday (February 21). The discussion will be led by Dr. Marlene Grenon, assistant professor of vascular and endovascular surgery at the University of California San Francisco. Dr. Grenon, who is also a graduate of the International Space University, is conducting studies simulating the effects of microgravity on Earth at both the physiological (organ) level and the cellular level. She was the lead author on a recent article in the British Medical Journal, ”Can I take a space flight? Considerations for doctors,“ which was widely reported by Forbes, NPR, and Space.com, among others. Other MDs on the panel are Alex Garbino, physiological monitoring lead for the Red Bull Stratos medical team; NASA astronaut Col. Yvonne Cagle (USAF-ret. ); and Ravi Komatireddy, KL2 Scholar of Wireless Health at the Scripps Institute. Also on the panel is Walter De Brouwer, Ph.D., founder of the personalized health electronics company Scanadu, which is competing to win the Qualcomm Tricorder X Prize. Last year, Dr. Komatireddy was part of a team that tested a ViSi Mobile Monitor device aboard a microgravity flight provided by the NASA Flight Opportunities Program. The panel, presented by the Silicon Valley Space Business Roundtable, takes place at the offices of the Orrick Law Firm, 1020 Marsh Road, from 6:30 to 9:00 PM. Admission is $35 for regular admission, $25 for Roundtable members, and $15 for students. Registration is available here. At 18,900-19,350 meters, the point known as “Armstrong’s Line,” the pressure experienced is enough to make fluids within the body boil at 37 °C, the temperature of the human body. This is not correct. Fluids in an open container will indeed boil at that temperature, above the Armstrong Line. The human body is not a closed container, however. It is enclosed by an elastic integument (skin), which prevents bodily fluids from boiling. Blood is additionally enclosed within the blood vessels. Saliva in the mouth will boil above the Armstrong line, but blood in the veins, arteries, and capillaries will not. Death from vacuum exposure will occur within minutes, but the cause of death will be hypoxia – lack of oxygen – not boiling blood. Proof of this fact comes from laboratory experiments with animals and also from NASA astronauts who have suffered rips in their pressure suits during EVA, resulting in parts of their body being exposed to hard vacuum. The result was some local swelling and discomfort, but no boiling blood, just as physics predicts. As we continue to develop and settle space, accidents and medical emergencies will happen. Soon or later, someone will need to do surgery in space. Equipment and procedures for surgery in zero and reduced gravity have yet to be developed and tested (a fact that’s often overlooked by advocates of manned deep-space missions), but some work has been done in this field. Dr. James Burgess, a neurosurgeon at Allegheny General Hospital in Pittsburgh and an adjunct faculty member at Carnegie Mellon University, has invented one such device. The Aqueous Immersion Surgical System is a transparent plastic box that can placed over a wound and pumped full of saline solution. Carefully designed openings keep fluid in while allowing access for for surgical tools. The saline solution is pressurized and controlled to reduce blood loss, which will be critical on space missions where blood for transfusions is limited or unavailable. AISS is being developed by a team of biomedical engineers and doctors from CMU and the University of Louisville. Prototypes will be tested on four flights of NASA’s C-9 microgravity aircraft on October 2–5. Additional microgravity flights are planned over the next three years. If the tests are successful, AISS may then be tested on a suborbital flight, according to Dr. George Pantalos, professor of surgery and biomedical engineering at the University of Louisville. The nature of surgical experiments requires hands-on access by the surgeon. This is another example of an experiment that can be performed on reusable suborbital spacecraft which cannot be performed on sounding rockets. The development of a robust commercial suborbital spaceflight may, therefore, be a crucial enabler for safe and effective deep-space exploration. Dressing for altitude is a technical history that covers US pressure suits from the 1930’s up through the Space Shuttle program. The focus is on “aviation” pressure suits, so the book does not cover the Gemini and Apollo spacesuits, or the Shuttle EVA suit, which are covered well in other publications. It does, however, include the Mercury spacesuit, which was derived from a US Navy aviator’s pressure suit. The Shuttle launch and entry suits are, of course, covered. This book will be of interest to anyone who’s concerned with commercial spaceflight safety. The ebook is available for free download from NASA. Safe, affordable pressure suits are a critical, enabling technology for commercial spaceflight. Cost reductions are especially important for suborbital spaceflight, where the ticket prices will be about an order of magnitude lower. Some progress has been made in this area. Orbital Outfitters and the David Clark Company have produced prototype suits for suborbital spaceflight. A new company, Final Frontier Design, recently unveiled its prototype and even held a successful Kickstarter campaign. This progress, while promising, is not sufficient. David Clark has a great of experience building pressure suits for NASA and the military, dating all the way back to the Bell X-1, but has never delivered a commercial spacesuit. (The company does have a great deal of experience delivering commercial products in other areas, however, especially its highly successful aviation headsets.) The other companies are startups, with a strong commercial orientation, but have not yet delivered a suit that’s actually flown in space. A healthy industry needs to have multiplier suppliers for critical components like spacesuits. A single source would lead to monopoly pricing and leave the industry vulnerable to single-point failures due to a natural disaster, product recall, or business failure. Two suppliers are better, but a single failure would still put the industry right back in a monopoly situation. For the long-term health of the industry, at least three viable suppliers are preferable. Right now, most impartial observers would put the number of proven suppliers at about one and a half. One way to address this problem is a prize for low-cost spacesuit development. A recent paper on the Toxicity of Lunar Dust highlights one of the problems that need to be solved for long-term space settlement. NASA’s been studying the dangers of dust for some time. The primary concern with lunar dust is silicosis, a condition which occurs when fine particles become embedded deep within the alveolar sacs and ducts where oxygen and carbon dioxide gases are exchanged. Other parts of the body may also be affected. The lunar dust is so fine that particles can pass through the capillaries and into the blood stream, making their way to vital organs including the heart, liver, and brain. The body’s immune systems are largely helpless against the dust particles, which are so sharp that white blood cells are destroyed when they attempt to engulf them. Even if dust is not inhaled, it can still cause skin and eye irritations. While lunar dust is primarily a mechanical irritant, Martian dust is expected to be both an irritant and a chemical poison. The Martian regolith may be a strong oxidizer comparable to undiluted lye or bleach, capable of burning human skin. Dust storms and static electricity may create hydrogen peroxide that falls to the surface as corrosive snow. If that wasn’t bad enough, the dust has also been found to contain trace amounts of toxic metals including arsenic and hexavalent chromium. NASA is working on ways to mitigate these hazards. The solution will no doubt involve extreme attention to cleanliness and strict isolation from the lunar/Martian environment. Nevertheless, accidents will still happen from time to time. 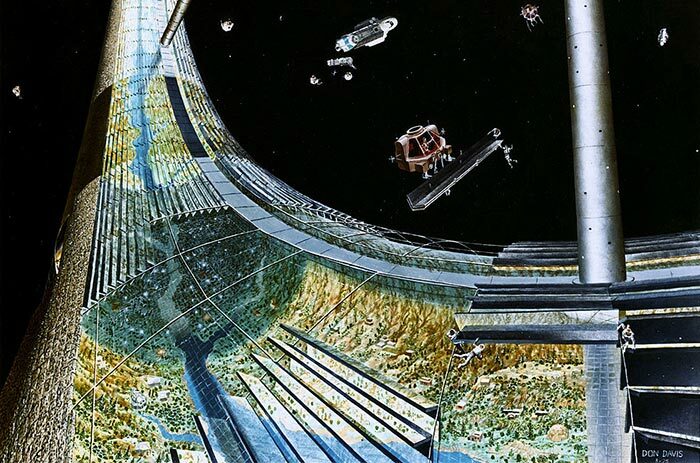 As we learn more about the toxicity problem, perhaps it’s time to revisit the question which Princeton professor Gerard K. O’Neill asked in 1969: “Is a planetary surface the right place for an expanding technological civilization?” After examining the problems of energy, gravity, and resources, Dr. O’Neill concluded that artificial structures (very large space stations) were a more logical location for long-term space colonization. His ideas were popularized in the book The High Frontier: Human Colonies in Space. Perhaps the Moon and Mars will be developed as mining sites and research bases, while the real settlements are built in free space. Yesterday, we reported on Astrobotics and Carnegie Mellon University working to develop robots for proving lava caves on the Moon and Mars. We look forward to the day when astronauts go cave exploring on other worlds. The European Space Agency already has a program that’s training astronauts in cave exploration in preparation for the isolation and close confines of the International Space Station. CAVES (Cooperative Adventure for Valuing and Exercising human behaviour and performance Skills) trains astronauts to work safely and effectively using crew procedures. Six astronauts will spend a week learning cave safety and exploration procedures on the Italian island of Sardinia. Then, on September 7, they will venture underground for a six-day mission in a Sardinian cave. Just as on ISS, the astronauts will have a busy research schedule. In this case, looking for new life forms in the largely unexplored caves. Researchers at Purdue University have discovered a possible method of predicting solar flares more than a day before they occur. The prediction method works by measuring differences in gamma-radiation levels from the decay of radioactive materials. Scientists have long believed the rate of decay to be constant, but that view has been challenged by recent findings. A new hypothesis holds that radioactive decay rates are influenced by solar activity, possibly due to variations in solar neutrinos. The solar influence varies with seasonal changes in the Earth’s distance from the sun and is also affected by solar flares. Wired has an article on an Apollo lunar orbit rescue concept from 1965. The idea was to have a specially outfitted Apollo Command Service Module, with a single pilot, standing by on the launch pad. If something went wrong with the ship in lunar orbit, the rescue ship would be launched. The problem with the concept is obvious. The crew in lunar orbit would likely run out of oxygen before the rescue ship arrived. Because of that limitation, as well as the cost, the rescue project was never pursued. Apollo was left with no rescue capability in lunar orbit. The Orion “Apollo on Steroids” architecture, pursued during the George W. Bush Administration, had the same safety vulnerabilities as Apollo, plus one additional failure mode. Instead of leaving a command module pilot in lunar orbit, the Orion architecture proposed to have all the astronauts descend to the surface, leaving the command module on autopilot for several weeks. At the end of their lunar stay, the astronauts would return to the Orion command service module and ask the computer to “open the pod bay doors,” as Arthur C. Clarke famously put it. NASA’s Radiation Belt Storm Probes arrived at Kennedy Space Center on May 1. The two probes, built at Johns Hopkins University Applied Physics Laboratory in Laurel MD and managed by Goddard Space Flight Center under the Living With a Star program, are scheduled for a predawn launch on August 23 aboard a United Launch Alliance Atlas V 401 rocket. The two probes will be enter into nearly identical, eccentric orbits that cover the entire radiation belt region, lapping each other several times over the course of the two-year mission. Observations from the two probes will enable the development of empirical and physics-based models for the radiation belts. The empirical models will be used by engineers to design radiation-hardened electronics, while the physics-based models will be used by forecasters to predict space weather and alert astronauts and spacecraft operators to potential hazards. Supernova weather: killer storm or cosmic breeze? Due to their possible effects on Earth’s climate, supernovae have been viewed as potential killers and linked to past extinction events. That may not be the whole story, however. A new study by Professor Henrik Svensmark of the Technical University of Denmark (DTU) suggests that supernovae are, on balance, good for life on Earth. Examining the geological and astronomical record for the past 500 million years, Prof. Svensmark found that the diversity of the Earth’s ecosystem tended to be greater in eras when nearby supernovae were plentiful. Prof. Svensmark hypothesizes that this is because the colder climate caused by cosmic rays results in a greater variety of habitats between polar and equatorial regions and creates stress that prevents ecosystems from becoming locked into fixed patterns. The picture is mixed, however. While supernovae have generally had positive effects on Earth’s biosystem, Svensmark says they have also caused prolonged glacial periods and sudden falls in sea level by 25 meters or more. As the emerging commercial space industry enables more people to travel into space, and we become more dependent on satellite systems for military and commercial purposes, accurate and timely space weather forecasts are a matter of growing importance. Will Watson, executive director of the Space Frontier Foundation, made some over-the-top statements about the Space Shuttle on a blog at the Forbes website. It’s important to note that this is a “contributor” blog. That means the author does not work for Forbes. She is an amateur blogger. Thus, she has no obligation to fact-check Watson’s statements or present contrary views. If she had, the errors would have been obvious. Written by Astro1 on March 26th, 2012 , Space Medicine and Safety Tags: Why humans? 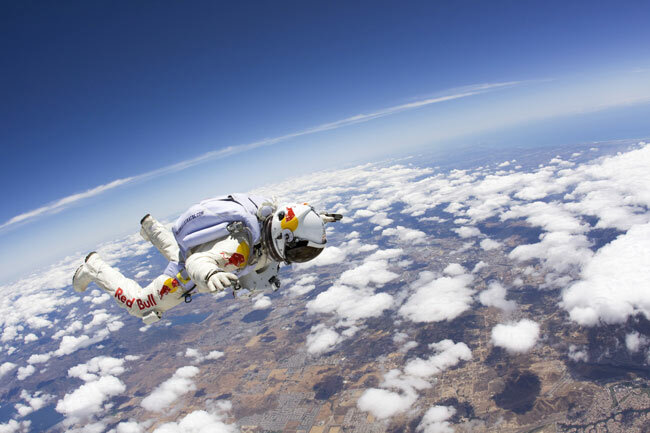 Felix Baumgartner has made his first test jump for the Red Bull Stratos team. On March 15, Baumgartner left the balloon-borne capsule at 71,581 feet. He free-fell for 3 minutes and 33 seconds before his parachute opened at 7,890 feet. During that time, he reached a maximum speed of 364.4 miles per hour. Baumgartner is expected to reach higher velocities, exceeding the speed of sound, on future jumps from higher altitudes. Baumgartner is only the third human being to have jumped from this altitude, which requires a full pressure suit for life support. The goal for future missions is to reach a jump altitude of 120,000 feet, breaking the world record for high-altitude skydiving set by Colonel (then Captain) Joe Kittinger in 1960. The spacesuit technology being demonstrated on these jumps will be applicable to suborbital space vehicles. A team of researchers using Magnetic Resonance Imaging has found that most astronauts exhibit optical abnormalities after long-duration spaceflights. The MRI study found that 33% of astronauts with more than 30 days of cumulative microgravity exposure showed expansion of the cerebral-spinal fluid space around the optic nerve. 22% shows flattening of the rear of the eyeball. 15% showed bulging of the optic nerve and 11% showed changes in the pituitary gland and its connection to the brain. NASA is concerned about vision changes which have been reported by astronauts returning from long-duration missions. A post-flight survey of 300 Shuttle and ISS astronauts showed that 60% of ISS astronauts reported a decline in far and near visual acuity. Only 29% of Shuttle astronauts (who experienced shorter missions) reported such a decline. How serious these changes will be is still unknown. Such changes are unlikely to be a problem for suborbital spaceflights due to their very short duration, but could become a limiting factor for interplanetary flights and other long-duration missions unless countermeasures such as artificial gravity are employed. 2012 promises to be a pivotal year for human spaceflight. Virgin Galactic has announced that it plans to begin powered test flights of SpaceShip Two around the middle of the year. XCOR Aerospace plans to roll out its Lynx suborbital spaceship about the same time and begin low-speed test flights by the end of the year. Sierra Nevada plans to conduct unpowered drop tests of its Dreamchaser lifting body in 2012 as well. And, of course, there’s SpaceX, which plans to test fly its Dragon capsule to the International Space Station this year. Armadillo Aerospace and Blue Origin are continuing development of their human-capable reusable spacecraft as well. The era of widespread citizen spaceflight is drawing near. The next few years will see a revolution in low-cost access to space, comparable to the revolution which occurred in the computer industry with the introduction of the microcomputer. The number of private citizens who travel into space in the near future will dwarf the 500 people (mostly government astronauts and cosmonauts) who have flown up to now. For this reason, it is important that the public (especially potential space travelers) understand the risks and safety aspects of these new spacecraft. One of the most common questions we ge is “Will the flights be safe?” The answer is ABSOLUTELY. We will not fly in any vehicle that hasn’t been approve by the FAA and been test flown for thousands of hours. The first vehicles will be those designed for general use in the space touism industry and will not be anymore hazardous than commercial air travel today. Unfortunately, the errors here go far beyond the obvious typos. Suborbital vehicles will not be “test flown for thousands of hours.” Suborbital flights will be fairly short. Flight durations may vary from 15 minutes or less (for VTOL rockets) to about an hour for air-launched vehicles like SpaceShip Two. Assuming that 30 minutes is typical and “thousands of hours” means just 2000 hours, this claim would translate into 4000 test flights. That is a huge number , by any standard. By comparison, the Boeing 787 had flown about 1700 test flights as of August, 2011. The 787 was a $32 billion program, according to Boeing. Virgin Galactic expect to spend about $500 million developing SpaceShip Two, and other companies hope to spend considerably less. The new reusable suborbital spacecraft will be tested more throughly than any previous launch system before entering commercial service. In all probability, that means many dozens of test flights. If the flight test program uncovers problems that need to be fixed, it could run to 100 or more. Developers won’t know the exact number until they begin the flight-test program and see the results. It certainly won’t be thousands – no developer could afford that. Nor does any vehicle developer, operator, or regulator expect that suborbital spacecraft will be as safe as commercial air travel is today. Today’s commercial airliners benefit from over 100 years of learning, experimentation, and continuous improvement. It would be unrealistic to expect the first reusable commercial spacecraft, which have not benefitted from that level of experience, to achieve the same level of safety right out of the box. The authors of those statements do not understand how space vehicles (including suborbital vehicles) are regulated by the FAA. The FAA does not certify (“approve”) space vehicles for passenger safety, as it does for commercial aircraft. Airplanes get FAA type certificates; space vehicles get launch licenses. This not merely a difference in nomenclature. The FAA issues type certificates based on empirical data, not only from the specific aircraft under test but also from decades of experience with similar aircraft types. That large base of empirical knowledge from similar types does not yet exist for reusable space vehicles. Only a few examples have been built and flown. Prior to SpaceShip One, there was only the X-15 and the partially reusable Space Shuttle. By contrast, hundreds of aircraft types were built and flown before the FAA was able to issue the first aircraft type certificates. Commercial space vehicles will have to go through a similar process of evolution to achieve similar results. There are no shortcuts. Spacecraft developers, the FAA, and the United States Congress have recognized that type certification is not a realistic goal for the commercial space industry at the present time. As a result, Congress has created a launch-licensing regime rather than a certification regime. Unlike type certification, which is designed to protect aircraft passengers and payloads, launch licenses are designed to protect third parties. The FAA will regulate suborbital spacecraft to ensure that their operation does not pose a significant risk to the uninvolved public. This form of regulation is similar to that found in the equine industry. Horseback riding is one of the most dangerous recreational activities. While there are no accurate figures, public-health authorities estimate that about 200 Americans are killed by horses each year. The government does not attempt to regulate the design or breeding of horses to ensure rider safety, however. Instead, an equine operator is required to inform riders of the risks inherent in equine activities, and the rider accepts those risks when he or she chooses to participate in equine activities. Of course, the risks involved in spaceflight are more complex than the risks involved in getting thrown off a horse. Informed consent for spaceflight will involved a substantial degree of education, not just reading a sign on the side of a barn. Accurate information and qualified instruction will be essential. That’s why statements like these, by well-meaning but poorly-informed enthusiasts, are troublesome. In the past, regulators paid little attention to advocacy groups that functioned as cheerleaders for concepts which were perceived (correctly) to be far beyond the horizon. As citizen spaceflight starts to become a reality, that is changing. We aren’t talking about viewgraph starships and science-fictional concepts anymore. We’re talking about real people, who will soon begin training to fly on real vehicles. It will be harder for spaceflight operators to provide the education necessary for informed consent if there is a general atmosphere of misinformation about vehicle safety created by careless, uninformed statements. There’s also a danger that such statements could create a legal or regulatory backlash against vehicle operators when an accident occurs. As suborbital vehicles begin flying into space hundreds, then thousands, of times a year, some accidents are inevitable. Accidents frequently bring lawsuits. If that occurs, trial lawyers are certain to notice statements such as these made by overeager and uninformed cheerleaders in the space advocacy community. They could be introduced as evidence in an attempt to show that spaceflight participants were misled about the risks and level of safety. Politicians could also latch onto the statements and call for more tighter regulations, which could throttle the embryonic spaceflight industry. The time for cheerleaders has past. Space-advocacy groups have an obligation to ensure the technical accuracy of statements they make, especially in public. Careless, technically inaccurate statements such as these have the potential to do far more harm than good. Solar Storm Threat Analysis is an interesting paper on the damage potential of solar storms. You are currently browsing the archives for the Space Medicine and Safety category.